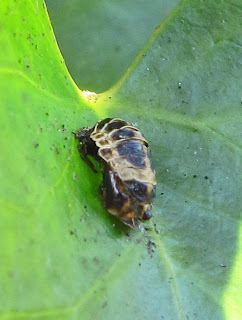 Those who do not live near ivy may not realise how poplar it is with insects. When it is in flower, you can hear them buzzing loudly as you approach. In the last week, I have been taking pictures of ivy in various stages - buds, flowers, beginnings of berries. The weather has been variable so I've been going backwards and forwards, trying out different lights. Sometimes, there were three insects per mini-firework display so my attention drifted to them . . . and from them to ladybirds in the leaves . 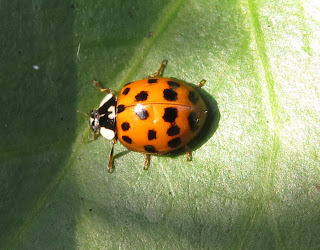 . . and from ladybirds to realising there are Harlequins here - Harmonia axyridis. The good thing about these ladybirds is that they eat lots of aphids. That's why, in 1988, some were taken from Asia and introduced into the U.S.A.. The trouble is, these ladybirds have such a great appetite for aphids . . . they gobble up every single available one of them. Indigenous ladybirds begin to starve to death. Does this bother the Harlequins? No. 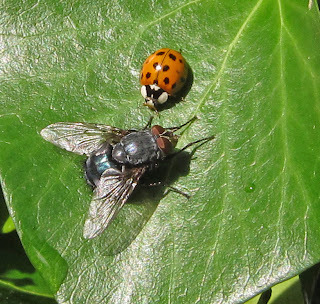 They extend their diet to include the already declining species of local ladybirds . 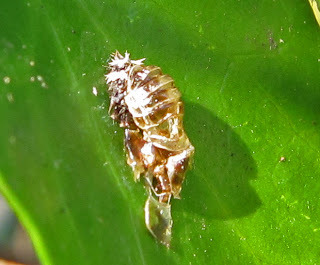 . . and lacewings . . . and butterflies . 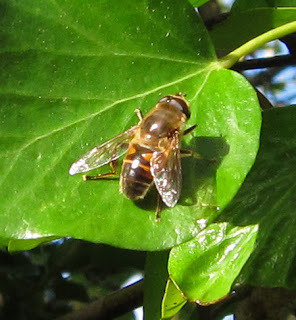 . . and hoverflies . . .
Their population is expanding. 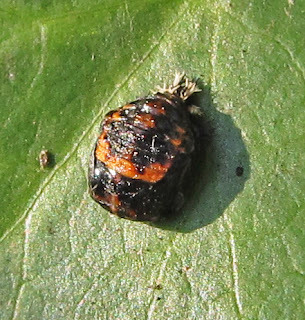 It is now the most widespread ladybird in North America and some species which used to be common in Canada are now rare. Bizarrely, despite this experience, Harlequins were introduced to mainland Europe as a device of pest control . . . and then they flew to the British Isles. There is a lot of alarm about this (naturally!) so the UK Ladybird Survey has set up a special section for monitoring their spread here. It's almost useless to explain what to look for because although the Harlequins I came across on the ivy look much like 'ordinary' ladybirds, they can come in a surprising number of guises. (Disguises!) The best thing (I suggest) for people in the UK to do is to submit photos of ANY ladybird to the UK Ladybird Survey. Not only will they be able to distinguish one species from another, it's as important to record the distribution and numbers of indigenous ladybirds as it is to make a map of Harlequin spread. The impact of Harlequins needs to be monitored - and it's good to keep an eye on what's happening to our wildlife whether or not we have concerns about the activities of a particular predator. There are charts and pictures on the UK Harlequin Survey site - these are worth consulting too. There's an interesting summary of information about Harlequins HERE - and information about studies of them in the London and Essex areas HERE. 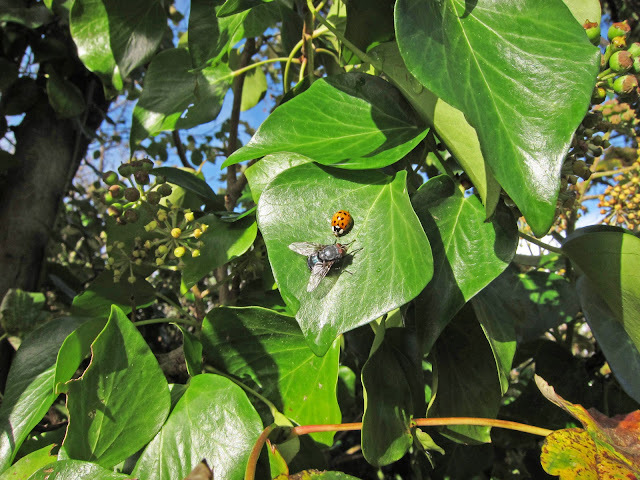 But what about other insects on the ivy? I went back to take photographs. The weather had cooled - was it this which meant there were fewer around - or was it that the sun was shining on the bushes and the insects preferred shade? . . .
And a Drone Fly. (Probably E. tenex). And a moth. 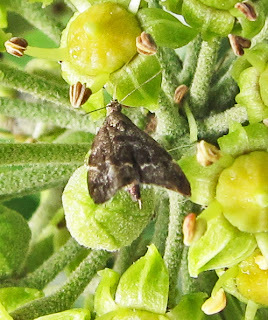 (Possibly a Nettle-Tap - Anthophila fabriciana). The rest kept flying around, buzzing off, flitting away - if only they had been prepared to sit as still as this snail! With thanks to members of iSpot for help with identifications. History of Harlequin invasion - on this page there is information about how to send live ladybirds to the Department of Genetics at Cambridge University. The address for this has changed and specimens are no longer needed from certain areas. Details are on the right hand side of THIS page, the address to which ladybirds may now be sent is on the left. Using sexually transmitted disease to render Harlequin females sterile is being studied at Cambridge University but parasites are another form of control. 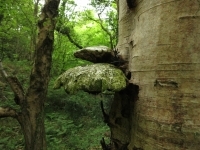 You might like to take part in a parasite survey on the BBC Breathing Spaces site. And . . . beyond ladybirds - here's a list of surveys UK residents can take part in with OPAL (Open Air Laboratories). And . . . I know I'm always going on about iSpot . . . but it really is worth belonging to / contributing to if you live in the UK. For readers in other parts of the world . . . there seem to be no parallel ways for people who live on mainland Europe to take part in surveys like these. It may be that there are some in North America . . . if there are, I'll add information here . . . or does anyone already know? P.S. You can follow Dr Helen Roy of the UK Ladybird Survey on Twitter. Bless you Lucy, I have been so confused by the Harlequins versus Natives, even after looking through the official site, but I think I have more of an inkling now. Even if I was certain that I was seeing a Harlequin I would be unable to kill it. Such a shame that it is so much competition to our lovely Natives. As for killing them - I don't think anyone is asking for that. For a start, there are too many of them. This is why studying is so important. They may gradually become prone to bacteria and parasites which are already here - and some native species are already showing signs of adapting to their presence, for example by changing their patterns of hibernation - even coming to an accommodation about who lives on which nettle. It may turn out alright in the end. Hope so! I didn't know anything about the history of the Harlequin ladybird, but looking back through my photos from earlier in the year, several of them are of Harlequins. The M shape you mention is clearly visible. Hi Mark. Will you be submitting your photos to the Harlequin Survey? In case you are thinking of doing so - there are banner links in the sidebar. Hello Diana - I hadn't known there is a South African iSpot till you said. The battery on my laptop is about to run out of power but when I plug in again, I'll put a link in the sidebar. Wonderful to see the startlingly different content. Interesting post Lucy, I knew that the Harlequin ladybirds are a problem but didn't realise just how voracious they are. I shall keep an eye out for ladybirds next year and try to get pbhotos for the survey. Too late for them up here now I suspect though I shall inspect my ivy next time we get a sunny day and see what there is. I let it grow thick and flower at the bottom of the garden because it gives both food and shelter to birds and insects when they most need it. I love these insects...here we call them ladybugs. 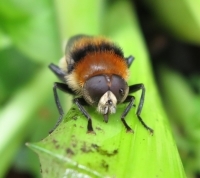 I try to entice them into the garden since they are a friendly sort of insect and champion aphid eater. Love the picture of the snail. I see that the Harlequins legs are "almost always brown" - if only they carried a placard or wore a badge it would be so much easier to identify them. Thank you for the information Lucy, I shall try harder next year. I noticed a great many Natives this year which pleased me no end. As you say, it might all turn out fine eventually. I will have to take another look at my ivy, that grows prolifically around the edge of the garden. Maybe it is much more interesting that I think it is!